Coverage: type of publications, languages, countries. This product focus exclusively on journals belonging to the areas of Arts, Humanities, and Social Sciences covered by Google Scholar Metrics (period 2010-2014). These areas have traditionally presented more difficulties in terms of bibliometric assessment, mainly because of the lack of international, geographically and linguistically unbiased tools. In these disciplines, where research is often oriented towards local interests and where cultural peculiarities are determinant, researchers usually use national channels -and their native language- to communicate their results. This is why Google Scholar, thanks to its robots that automatically index all seemingly scientific publications without any kind of geographic or linguistic restriction, is the most appropriate search engine for these disciplines. Natural and Experimental Sciences are excluded from this product, since there are already suitable products for them which take care of their evaluative needs (Web of Science and the Journal Citation Reports, Scopus and Journal Metrics). Regarding the geographic and linguistic scope of Journal Scholar Metrics (JSM), this product will display journals from all around the world and in all languages, providing that the name of the journal is displayed in latin characters in GSM. Thus, names of journals written in Arabic, Cyrillic, Chinese, Korean or Japanase characters are excluded. Ulrichsweb: Global Serials Directory. It is considered the largest and most up-to-date directory of periodic publications in the world. We retrieved the list of all existing scientific journals (academic/scholarly) indexed in the 162 categories («subjects») concerning Arts, Humanities, and Social Sciences. Web of Science Master Lists: journals indexed in the 84 subject categories included in the Arts & Humanities Citation Index and the Social Science Citation Index. SCImago Journal Rank: journals indexed in the 64 subject categories included in the areas related to the Humanities and Social Sciences. Google Scholar Metrics: All journals indexed in the categories “Humanities, Literature & Arts”, “Social Sciences”, and “Business, Economics & Management” were downloaded. Using the information retrieved from these databases, a journal master list was developed where titles were unified and any duplicates merged, resulting in an exhaustive database that combined the information contained in all the databases described above. The bibliographic information contained in Ulrichs was given precedence in case of any discrepancy with the information contained in other databases. 66,454 unique journals were identified. Two strategies were followed in order to find these journals in GSM. First, we searched all journals in our master list on GSM by their names. Secondly, in order to find journals in GSM which weren’t already in our master list, we performed topic searches in GSM using meaningful keywords. These searches were carried out using the following languages: English, French, Spanish, German, Italian, Portuguese, Polish, and Czech. Journal names and indicators (H5-index, H5-median). Bibliographic information of the articles published in each of those journals, including the number of citations these articles have received. Only the articles that contribute to the H5-index of the journals are displayed (nº of citations ≥ H5-index). Bibliographic information of the documents that cite each article in each of the journals. All journals found in GSM have been assigned to at least one of the following subject categories. A journal assigned to a subject category may be considered either a core journal, or a related journal. Core journals are those publications which are considered essential in a category. Related journals are those which are linked to the category because some (but not all) of the articles they publish are relevant to the category. In order to make these distinctions we relied on the classifications made by other databases (Ulrichs, Web of Science, Scopus, disciplinary-based databases…). 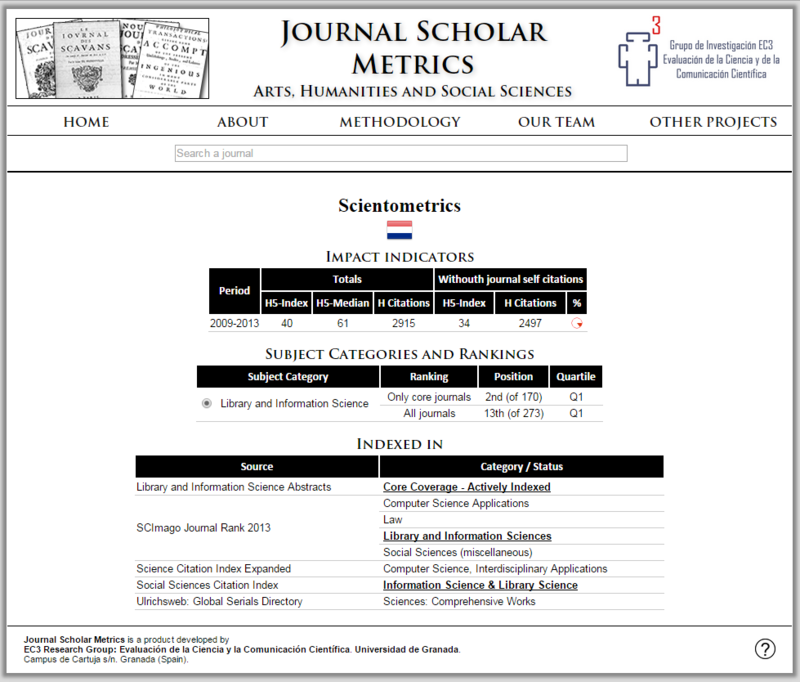 The decision to assign a journal to a category and whether to consider it core or related is made after examining the categories to which the journal has been assigned in other databases, whether it has been considered as a core journal in those databases (when that distinction is made), and after analysing its in-coming and out-going citation patterns, the use of meaningful keywords in the articles, and the affiliation of the authors who publish in it. H5-index: the h-index for articles published in the last 5 complete years. It is the largest number h such that h articles published in 2010-2014 have at least h citations each. H5-median: median number of citations for the articles that make up a journal’s h5-index. H5-citations: sum of the number of citations received by all the articles that make up the journal’s h5-index. H5-index without journal self-citations: computed in the same way as the H5-index, but excluding citations that come from articles published in the same journal. H5-citations without journal self-citations: computed in the same way as the H5-median, but excluding citations that come from articles published in the same journal. Journal self-citation rate: Percentage of citations to a journal that come from articles published in the same journal. Rankings are presented by subject categories, which may be selected from the Home Page. By default, only Social Sciences categories are shown. Click on the “Arts & Humanities” header to show the subject categories for this area. Clicking on any of the subject categories will take you to the ranking of that subject category. (NOTE: only the Library & Information Science category is functional as of now, more categories will be coming shortly). Subject rankings can be sorted by any of the six bibliometric indicators presented in the table, as well as by the country of publication, just by clicking on their respective column headers. 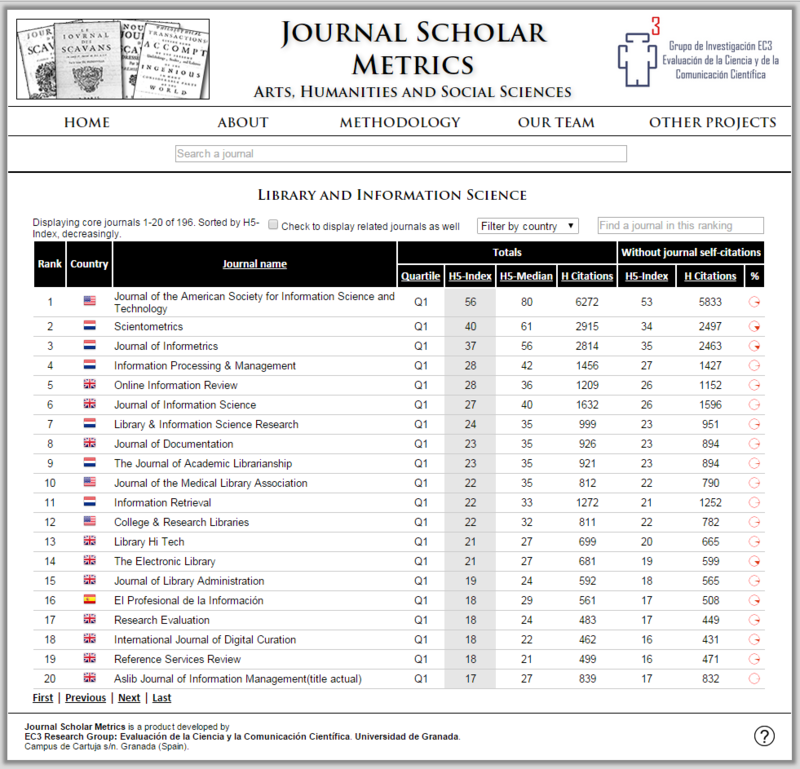 Only 20 journals are shown at a time, but you may consult the rest of the journals in the category by clicking on any of the four links available in the navigation menu available at the bottom of the table. These links will take you to the first, previous, next or last page of the ranking you are currently browsing, while at the same time mantaining your current sorting parameters. A description of what the table is currently showing. A check box to show or hide related journals. When the box is checked, core journals are highlighted using bold letters, and related journals are slightly translucent. When the box is not checked, only core journals are shown. Related journals are not shown by default when you select a subject category from the Home Page (the box will be unchecked). Note: please bear in mind that the ranking (position, quartiles) shown when the box is unchecked (only core journals shown) is different from the ranking shown when the box is checked (both core and related journals are shown). A drop-down list to filter by country of publication. When a country is selected, only the journals published in that country and assigned to the current category will be shown. The core/related check box is checked by default when a country is selected (since the journals from that country may have been all considered related journals). A search box from which it is possible search any journal in the current category. When a journal is selected, you will be taken to the page where that journal appears, and it will be highlighted with a grey background and bold lettering. Name of the journal and country of publication. Impact Indicators: the same indicators that are shown in the ranking page. Subject categories to which the journal has been assigned, and position it occupies in the category: a journal may be assigned to more than one category. Additionally, if the journal has been considered a core journal in the category, you’ll see two different positions and quartiles. The first one (Only core journals) is the position and quartile the journal occupies in the category when only core journals are considered. The second one (All journals) is the position and quartile it occupies in the category when both core and related journals are considered. Otherwise, only the "All journals" position and quartile will appear. Indexed in: this table presents a list of databases where this journal is also indexed, as well as the categories these databases have assigned to the journal, according to their respective classification schemes. The subject category table also includes a radio button to the left of each of the category where the journal has been assigned. This button, when clicked, will highlight related categories in the “Indexed in” table. 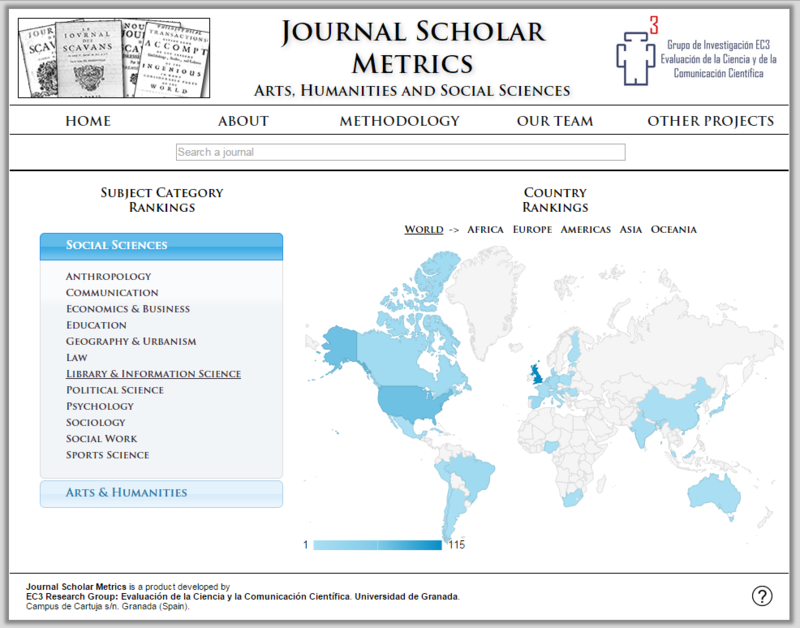 The Home Page also presents a world map from which users can access all journals in this product published in a given country, regardless of their topic. Since there might be difficulty in clicking some countries in the world map because of their size, it is also possible to display continent maps, as well as smaller territories. 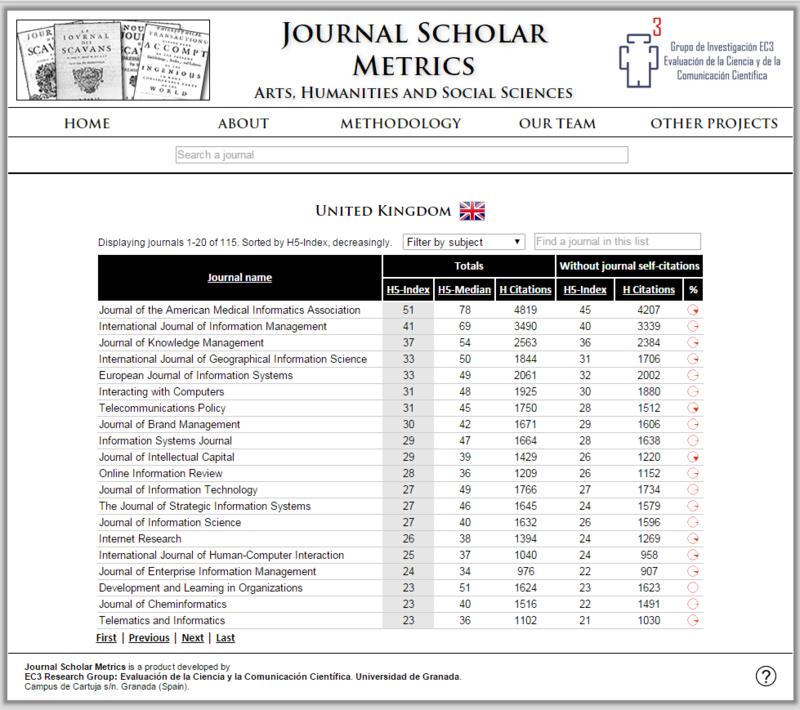 The shade of blue indicates the quantity of journals in JSM published in that country, and a box with the name of the country and the exact number of journals collected so far in JSM will pop up when you hover over it with the cursor. When a country is selected, all journals published in that country will be shown. The options available in these lists are very similar to the ones shown in the subject rankings. The only difference is that instead of being able to filter by country, in this table you can filter by subject category. Lastly, below the navigation menu there is a box from which you’ll be able to search any journal that has been included in this product. When you select a journal, you will be taken to its profile page.